Hi @adsactly readers and welcome back to another installment on our series on tortured artists. This is the penultimate part in this series and it focuses on Mexican surrealist and icon Frida Kahlo. Thank you @cristiancaicedo for the fascinating suggestion! Another really interesting artist with a strange and rather sad life is Mexican painter Frida Kahlo, who is now greatly admired as a member of the surreal movement as well as an emblem of Mexican culture and identity (which was heavily featured in her paintings). Kahlo was born a ghost, in a weird sort of way. Her mother Matilde was, at the time of Frida’s birth, still mourning the loss of her infant son, who’d only lived a few days after being born. Frida often claimed that the atmosphere in her house was a very sad, sober one and obviously, her mother’s grief and (presumably) resentment towards the children who followed her lost boy only helped loosen in Frida a sense of self that was already pretty shaky. In contrast, Frida had a very close relationship with her photographer father, Guillermo, who suffered from epilepsy and probably identified with Frida, who was crippled by polio in her childhood (it atrophied her right leg, causing it to wither and become shorter and considerably thinner than the other). She is also believed to have been sexually abused by her gym teacher. Although drawn towards art from an early age, Frida didn’t want to be a painter in her youth. In fact, she trained to be a doctor, until the age of eighteen, but that dream was shattered after she was involved in a horrendous bus accident, which left her unable to walk for three months. During that time, she returned to her childhood hobby of painting. She had a mirror installed above her bed and painted several self-portraits, as well as many portraits of her family and friends. During this time, she grew very distressed at losing the affection of her long-time boyfriend, Gomez Arias (who had also been in the accident with her, but sustained rather few injuries). It’s interesting to note Frida developed an obsession with fellow Mexican artist, Diego Rivera, at the tender age of fifteen (he was twenty years her senior) and told friends she would have his child. They met, fell in love and married later on and maintained a relationship throughout her life. 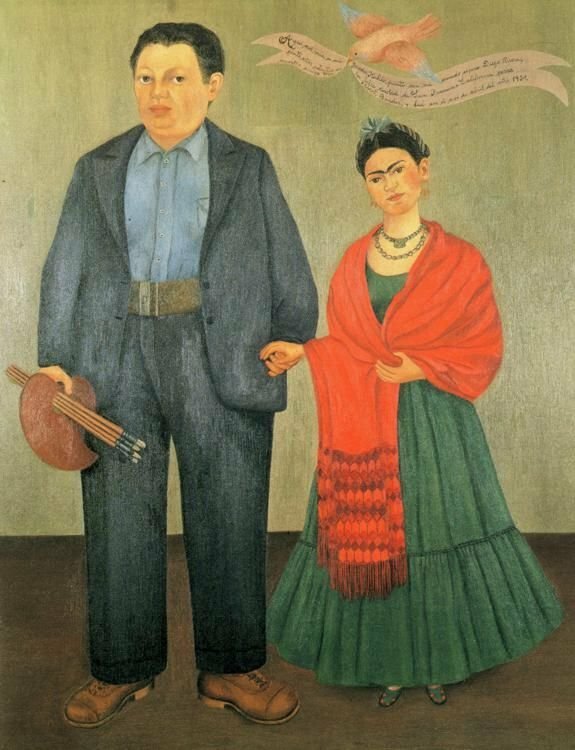 It was a strange union, one Frida’s father described as “marriage between an elephant and a dove”, since Diego was seriously overweight, a good deal taller than Frida who was short and slender. Frida became obsessed by Diego and catered for him, took care of him and babied him to an almost ridiculous extent. It’s believed that her inability to bring a child to term caused her great pain. She underwent two abortions and miscarried once, as her pelvis was severely damaged both by polio and the accident, as were her ovaries. However, some have claimed that Frida wouldn’t have been emotionally capable to nurture a child, even if she could have had one physically, due to her obsession with caring for her husband. Her relationship with Rivera soon turned into a troubled one, with Diego cheating on her as much as he could, most notably with her own sister, Cristina, only eleven months her junior. Frida, in turn, took her revenge on Diego by sleeping around, most notably with Communist figure-head Leon Trotsky (both Frida and her husband were communists ans were both questioned after Trotsky’s assassination), which understandably infuriated Rivera. Eventually, Diego filed for divorce, in 1939, sending Frida into a rage. Her already precarious health only worsened after the divorce, and she suffered horrible pain in her twisted spine and serious kidney infection. Her heavy consumption of alcohol and cigarettes, as well as eating loads of sweets each day didn’t help. Upon hearing about Kahlo’s health, Diego felt awful and sent for her, which blew some life into Frida and they were re-married in 1940. It’s easy to see, in Frida Kahlo’s paintings, how much her health problems weighed on her mind. View, for example, The Broken Column of 1944 or Tree of Hope (1946). 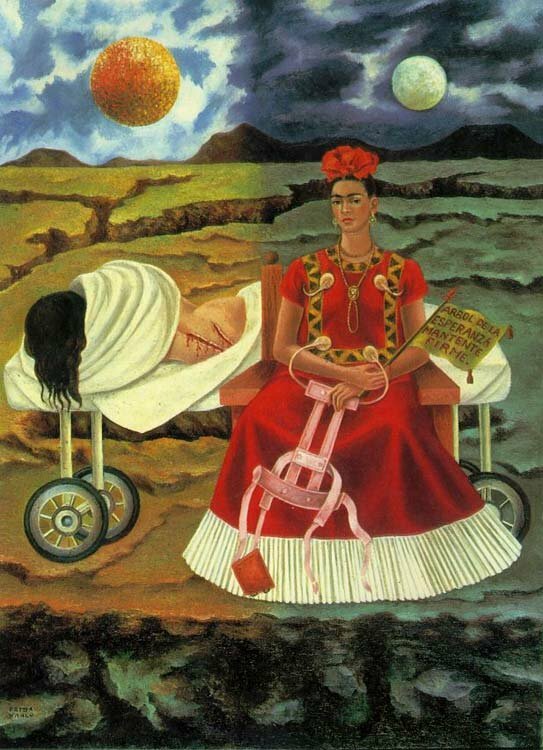 But then again, death had always played an important role in Frida’s art. By that time, her health had declined so much that she couldn’t really sit or stand properly and was often confined to her bed. Obviously, the fact that her husband was still cheating on her didn’t help her mental balance. She was seriously depressed for most of the last decade of her life. In July 1954, she was suffering with a high fever and even though her drug intake was being monitored, it is commonly believed she overdosed on painkillers, thus taking her own life, even though the official cause of death is pulmonary embolism. 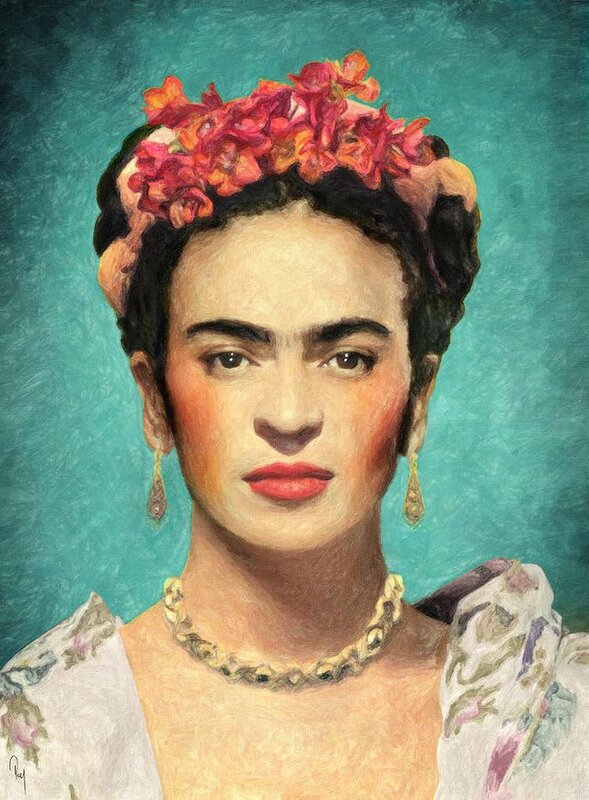 During her life, Frida saw some recognition in the artistic world, most notably in her native Mexico, but this recognition only developed later in her life and saw a huge growth after her death (she is still regarded by many, including various minorities, as a hero and cultural icon). Upon hearing of Kahlo’s precarious health, photographer Lola Alvarez Bravo staged her first solo exhibiton at the Galería Arte Contemporaneo in Mexico in 1953. Due to the fact Kahlo was confined to her bed by then, it was at first believed she would not attend. But she had her bed transferred to the Galeria and she was herself carried there on a stretched and attended, in her bed, until the party ended. Frida Kahlo’s life was a terribly sad and tormented one. 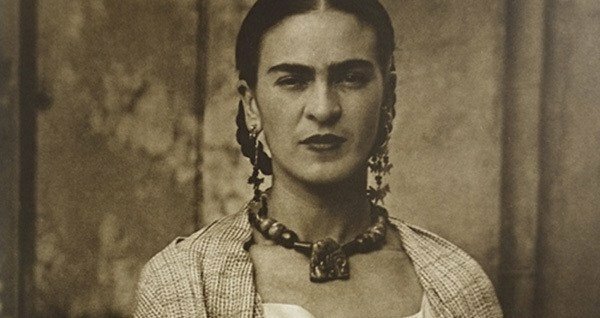 But to be honest, I think that only strengthens the Kahlo cult that exists around the artist today. So, what do yu think? Are you a Kahlo fan? Absolutely profound. Barely know the life of Frida Kahlo, besides what the movie tells you, but I'm aware of the internal struggles she needed to face throughout her life and it's so empowering, even as, listening to those tales. Your post presents us with a good overview of the possible reasons for the tormented life of Frida Kahlo, who is one of the most attractive and enigmatic American (particularly Mexican) artists. I remember reading through this blog an article by @nancybriti where she introduced us to Kahlo and Rivera as a particular case of a conflictive love couple. Perhaps this one, along with their unhealthy state, are the heaviest. Her work, between a figurativism with a surreal tinge and the nativist influence, plus her feminist emblemization have become part of a sort of collective imaginary. The film starring Salma Hayek is a good attempt, although I liked the one directed much earlier by Paul Leduc, and its use in Coco is very striking. Grateful for your informative and illustrated (in both senses) work, @honeydue. I love Frida! Not only in Mexico, in all of Latin America she is considered a cultural icon, one of the most "machas" women in the history of art. Her life was not easy, among diseases, vices and loves. Frida was so angry about Diego's infidelity that she not only cheated on him with men, but also had relationships with women. From time to time I like to quote two of her most famous phrases: "I drank because I wanted to drown my sorrows, but the evil ones learned to swim..." and "Feet, why do I want them if I have wings to fly", which although they are very beautiful, reflect two great problems in Frida's life: her problem with alcohol and her lack of mobility. Thanks for this post, @honeydue! Every artist with great work is always accompanied by a journey of life full of suffering. Is this a source of strength in work? At least, these artists have inner experiences that are so profound that each of his works is an expression of feelings. if a painter like Kahlo, managed to paint brushes and colors of life in a canvas, so it is no wonder that it will produce extraordinary works of art. In my shadow when I brushed the brush he felt he was telling me about the pain that struck him. then every stroke on the canvas makes a story that becomes a mosaic of life. and we then look at the beauty in a picture. Certainly Frida's life was somewhat complicated and difficult, but it highlights her struggle to express all her feelings in her art. I think there lies the admiration for his work. Indeed it was. No surprise why she's the leading model of the feminist movement in Mexico. I hope at least some day I can be added to this list. Might make my pain worth while.
" Ahí les dejo mi retrato, pa´ que me tengan presente, todos los días y las noches, que de ustedes yo me ausente. " You just got a 0.35% upvote from SteemPlus! You might find this oddly interesting. A friend of mine did this presentation of Frida for her final project in dance for CU...yes, dance. Sorry, I forgot to attach the video last post. Here it is.